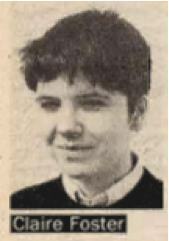 'Claire Foster' AKA Claire Fox as a Revolutionary Communist Party council candidate in Newcastle, as featured in The next step, 2 May 1986, p. 4. Brought up in Clywd, North Wales, she was characterised as having a domineering character even as a child. In contrast, Fox recalls 'I was a ballet student for 12 years from the age of 4, and there is no denying that my teachers were unsentimentally critical, used their hands to push my body into shapes and postures it was reluctant to adopt and demanded a relentless, repetitive practice regime.'. Despite attending St. Richard Gwyn Catholic High School, a school she later characterised as a "bog standard comp",  she was able to obtain admission to Warwick University, finally achieving a lower second class degree in English and American literature. Following university, Fox became a social worker from 1981 to 1987, working in mental health, with the homeless in Coventry, and with battered women. She then became an English Language and Literature lecturer for special needs adults at Thurrock Technical College (now Thurrock and Basildon College) during 1987-90. Obtaining a PCGE from Thames Polytechnic (now the University of Greenwich) in Eltham during 1991-1992, she taught at West Herts College during 1992-1999. Disillusioned with the then Labour government and having been exposed to Catholic liberation theology as a teenager,   Fox joined the Socialist Workers Party as a student at Warwick University,   despite a background as an anti-abortion activist with the Society for the Protection of the Unborn Child. Considering the SWP crude and untheoretical,  she left them to join the Revolutionary Communist Tendency, later renamed the Revolutionary Communist Party, possibly partly due to their uncritical pro-Irish Republican line, which will have resonated with Fox’s Irish Catholic background. Her strong Republican leanings are suggested by the role of her sister Fiona as a leading member of RCP front the Irish Freedom Movement and editor of its bulletin Irish Freedom. Though her anti-abortion and Catholic background delayed her admission,  Claire Fox was eventually accepted. She stood in the local elections for the party in May 1986, contesting the Benwell ward in Newcastle. She remained a member until its dissolution in 1996, becoming a branch organiser and then leaving her teaching job to work on its monthly magazine Living Marxism  with a party name (pseudonym) of Claire Foster. When the RCP disbanded, Fox relaunched Living Marxism as LM, taking the role of co-publisher with Helene Guldberg.. After the magazine was bankrupted in a libel trial in 2000, Fox founded the Institute of Ideas, building on the existing RCP summer school, while other members set up on line magazine Spiked. She is a director, company secretary and shareholder of the company which runs the Institute, the Academy of Ideas, and is the director of the Institute. Fox is regularly invited to comment on developments in culture, education, politics and the arts on BBC programmes such as Question Time, Any Questions? and Breakfast and on SkyNews Review. She has been a regular panellist on BBC Radio 4’s Moral Maze since 2001, later joined by LM associate Kenan Malik, while other LM associates regularly appear on the programme as witnesses. She writes for national newspapers and a number of specialist journals, has a monthly column in the MJ (Municipal Journal) and presented ‘Claire Fox News’ on the defunct internet TV channel 18 Doughty Street during 2006/7. She is also a Member of the European Cultural Parliament and sits on the Advisory Board of the Economic Policy Centre. Claire Fox, 'Taboos: A comprehensive failure', Living Marxism, No. 89 - April 1996, p. 8. Claire Fox, 'Disruptive pupils: teachers give wrong answer', Living Marxism, No. 91 - June 1996, p. 29. Claire Fox, 'Degrading education', Living Marxism, No. 95 - November 1996, p. 24. Claire Fox, 'Who's afraid of schoolchildren? ', Living Marxism, No. 96 - December/January 1996/1997, p. 14. Claire Fox, 'Nanny Blunkett knows best', LM 100, p. 18, May 1997. Claire Fox, 'A day out on the hunting demo', LM 103, September 1997, p. 19. Claire Fox, 'The dumbing down of higher education', LM 104, p. 24, October 1997. Claire Fox, How class rules the classroom, Times Educational Supplement, 17 October 1997. Helene Guldberg and Claire Fox, 'Appeal in Defence of Free Speech', LM 108, p. 24, March 1998. Claire Fox and Helene Guldberg, 'Free Speech Wars festival', LM 109, p. 19, April 1998. Claire Fox, 'And the Devil spake unto her', LM 110, May 1998. Claire Fox, 'Snobs against sobbing', LM 111, p. 22, June 1998. Claire Fox, 'Loaded questions', LM 112, p. 16, July/August 1998. Claire Fox, 'Connected TV', LM 115, November 1998, p. 14. Claire Fox, 'Docusoap meets current affairs', LM 118, p. 40, March 1999. Claire Fox, 'Culture Wars', LM 119, p. 12, April 1999. Claire Fox, 'Does life imitate Shakespeare? ', LM 120, p. 20, May 1999. Claire Fox, 'Museums: don't touch the exhibits', LM 122, p. 42, July/August 1999. Claire Fox, 'Social inclusion': excluding ideas', LM 123, p. 35, September 1999. Claire Fox, 'What is so Scottish about that? ', LM 125, p. 18, November 1999. Claire Fox, 'Are you who you write? ', LM 126, p. 32, December/January 1999/2000. Claire Fox, 'Veiled truths', LM 128, p. 40, March 2000. Claire Fox, 'The hollow men', LM 129, p. 32, April 2000. Claire Fox, 'Your guide to joining the new cultural elite', LM 129, p. 34, April 2000. Claire Fox, Knowledge without wisdom, Times Educational Supplement, 15 September 2000. Claire Fox, Peer pressure, a part of growing up, Times Educational Supplement, 24 November 2000. Claire Fox, ICT clearly now the brain has gone, Times Educational Supplement, 25 May 2001. Claire Fox, Put philosophy back on society's curriculum, Times Educational Supplement, 10 January 2003. Claire Fox, Don't pass the buck, Times Educational Supplement, 7 May 2004. Claire Fox, Are we all bullies now?, Times Educational Supplement, 10 September 2004. Claire Fox, Would social services teach Shakespeare, Times Educational Supplement, 4 February 2005. Claire Fox, No respect from pupils or politicians, Times Educational Supplement, 29 April 2005. Claire Fox, '2012 Cultural Olympiad', Time Out, 24 July 2007. Claire Fox, 'Anything but the arts', myA&B Arts & Business blog, 16 July 2007. Claire Fox, 'Strike up the band for elitism', The Australian, 18 August 2007. Claire Fox, 'Debate is being stifled by a new form of inquisition', The Independent, 25 October 2007. Claire Fox, 'Religion and free speech', Time Out, 11 December 2008. Claire Fox, 'A needle in a haystack', MJ (municipal journal), 4 March 2009. Claire Fox, 'Wheeling out the unpalatable', MJ (municipal journal), 25 March 2009. Claire Fox, 'Give this moralising the brush-off', MJ (municipal journal), 22 April 2009. Claire Fox, 'Engagement is kids’ stuff', MJ (municipal journal), 30 April 2009. Claire Fox, 'Censorship is the wrong way to combat BNP', Index on Censorship, 3 June 2009. Claire Fox, 'Censoring the BNP 3: Claire Fox responds to Andy Newman', Index on Censorship, 10 June 2009. Claire Fox, 'Give us some space', MJ (municipal journal, 22 July 2009. Claire Fox, 'Article on idealism', Fabian Review, Summer 2009. Claire Fox, 'Could sisters do it all better? ', MJ (municipal journal), 12 August 2009. Claire Fox, 'Stop monitoring the public', MJ (municipal journal), 30 September 2009. Claire Fox, 'Academy strikes back: the fight for 'useless' knowledge starts here', Times Higher Education, 1 October 2009. Claire Fox, 'Don't ban the BNP - even racists deserve a debate', London Evening Standard, 19 October 2009. 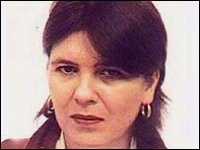 Claire Fox, 'No means no. But what about yes? ', The Herald (Scotland), 4 July 2010. Claire Fox, What value is a scoial enterprise?, MJ (municipal journal), 26 May 2011. Claire Fox, On the shelf, MJ (municipal journal), 26 May 2011. Claire Fox, 'It’s not children who are sexualised … it’s us', The Herald (Scotland), 26 June 2011. Claire Fox, Bill Stickers is innocent ok!, MJ (municipal journal), 30 June 2011. Claire Fox, Hacked off, MJ (municipal journal), 9 August 2011. Claire Fox, Adult authority has been eroded, MJ (municipal journal), 14 September 2011. Claire Fox, Blaming others for the riots is a cop out. Kids are spoilt by schools, Times Educational Supplement, 16 September 2011. Claire Fox, Unwrapping urban myths, MJ (municipal journal), 6 October 2011. Claire Fox, It's the economy we need to worry about – not bonuses, MJ (municipal journal), 7 February 2012. Claire Fox, Listen kids. Life is hard work, MJ (municipal journal), 20 March 2012. Claire Fox, Sober reading..., MJ (municipal journal), 20 April 2012. Claire Fox, Crimbos are criminal, MJ (municipal journal), 7 June 2012. Claire Fox, An open and shut argument, MJ (municipal journal), 11 July 2012. Claire Fox, Losing out at the Olympics, MJ (municipal journal), 15 August 2012. Claire Fox, Time to come clean on planning, MJ (municipal journal), 19 September 2012. 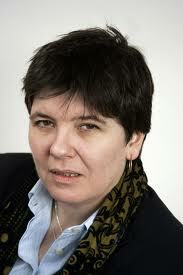 Claire Fox, Free speech allowed: Why Europe needs debate, The Independent, 28 September 2012. Claire Fox, The intellectual virtues of failing your exams, Times Educational Supplement, 19 October 2012. Claire Fox, Can everyone please calm down about child abuse?, The Independent, 25 October 2012. Claire Fox, Let's avoid a knee-jerk response to Savile, MJ (municipal journal), 8 November 2012. Claire Fox, Don't let value-mongers hijack the classroom, Times Educational Supplement, 7 December 2012. Claire Fox, We need to talk..., MJ (municipal journal), 9 January 2013. Claire Fox, Progress or NIMBYism, MJ (municipal journal), 21 February 2013. Claire Fox, An art-free EBac is not the end of the world, Times Educational Supplement, 22 March 2013. Claire Fox, Make compassion a priority, MJ (municipal journal), 25 March 2013. Claire Fox, Bound and gagged, MJ (municipal journal), 24 April 2013. Claire Fox, Face the facts: without them we know nothing, Times Educational Supplement, 26 April 2013. Claire Fox, This is not the time to panic, MJ (municipal journal), 12 June 2013. Claire Fox, Glenn Greenwald and a police force that is high on misusing the law, The Independent, 19 August 2013. Claire Fox, The line between good teaching and abuse, Times Educational Supplement, 30 August 2013. Claire Fox, Stand up for lobbying, MJ (municipal journal), 3 September 2013. Claire Fox, Leveson has done his damnedest to encourage press regulation, despite his protestations, The Independent, 11 October 2013. Claire Fox, Why student voice has gone way too far, Times Educational Supplement, 18 October 2013. Claire Fox, It’s a sick society that encourages its citizens to view everything going on around them with suspicion, The Independent, 10 December 2013. Claire Fox, Girls can win the war of words. Discuss, Times Educational Supplement, 10 January 2014. Claire Fox, Dreaming of life, the universe and everything, Times Educational Supplement, 7 March 2014. Claire Fox, Fools rush in, MJ (municipal journal), 10 April 2014. Claire Fox, Fat chance of a reasoned debate, MJ (municipal journal), 8 May 2014. Claire Fox, Beware the fury of a patient man, MJ (municipal journal), 10 June 2014. Claire Fox, How to save libraries from the e-predators, Times Educational Supplement, 20 June 2014. Claire Fox, The Cinderella Law is criminal, MJ (municipal journal), 17 July 2014. Claire Fox, A point of principle, MJ (municipal journal), 20 August 2014. Claire Fox, Let the good times roll, MJ (municipal journal), 13 October 2014. Claire Fox, Politicised pressures of food banks, MJ (municipal journal), 8 December 2014. Claire Fox, Is free speech offensive?, MJ (municipal journal), 19 January 2015. Claire Fox, Is Prevent better than cure?, MJ (municipal journal), 3 March 2015. Claire Fox, A waste of space, MJ (municipal journal), 14 April 2015. Claire Fox, Not the end of the world, MJ (municipal journal), 26 May 2015. Claire Fox, Don’t learn the wrong lessons, MJ (municipal journal), 18 August 2015. Claire Fox, How are we going to build our future?, MJ (municipal journal), 14 October 2015. Claire Fox, Do we actually need to level the playing field?, MJ (municipal journal), 19 November 2015. Claire Fox, Don’t just cringe – stand up to jihadi ideas, Times Educational Supplement, 18 December 2015. Claire Fox, 10 best desk exercise equipment, The Independent, 21 January 2016. Claire Fox, ‘Schools should not have to worry about being attacked in the same way as Peter Tatchell’, Times Educational Supplement, 20 February 2016. Claire Fox, ‘We must stop continually talking up childhood complaints as mental health problems’, Times Educational Supplement, 25 February 2016. Claire Fox, Boycott illiberal bans, MJ (municipal journal), 1 March 2016. Claire Fox, Brexit: ‘Teachers must dispel the myths about themselves, their pupils and their parents, and Europe itself’, Times Educational Supplement, 6 March 2016. Claire Fox, 'By banning rugby in schools, we're raising children to be scaredy cats', Times Educational Supplement, 19 March 2016. Claire Fox, 'Should teachers be proud that binge-drinking, feckless, wild-living teens are a thing of the past?, Times Educational Supplement, 4 April 2016. Claire Fox, Beware the Eurocrats’ agenda, MJ (municipal journal), 6 April 2016. Claire Fox, Panama Papers: ‘Never mind financial literacy, what we need today are some grown-up lessons in economics’, Times Educational Supplement, 17 April 2016. Claire Fox, 'School corridors are bursting with sexual tormentors, prowling in search of helpless prey? I just don't buy it', Times Educational Supplement, 24 April 2016. Claire Fox, Sats: ‘Are we in danger of “weaponising” the alleged misery of children for political ends?’, Times Educational Supplement, 3 May 2016. Claire Fox, Back to school, MJ (municipal journal), 17 May 2016. Claire Fox, 'It doesn’t work when politicians insist on dumbing down to young people – just ask teachers', Times Educational Supplement, 2 June 2016. Claire Fox, Pull no punches, MJ (municipal journal), 15 June 2016. Claire Fox, 'If adults criticise the views of the young, they are accused of jeopardising their mental health', Times Educational Supplement, 20 June 2016. Claire Fox, 'A generation endlessly resitting exams until they pass thinks you can revolt until the stupid wrinklies vote the correct way', Times Educational Supplement, 29 June 2016. Claire Fox, Relinquish your power, MJ (municipal journal), 20 July 2016. Claire Fox, No lights out for nights out, MJ (municipal journal), 6 September 2016. Claire Fox, 10 best parenting books, The Independent, 26 September 2016. Claire Fox, The real lesson from grammar schools, MJ (municipal journal), 5 October 2016. Claire Fox, 'A liberal arts education is threatened by students' narcissistic views about what is relevant', Times Educational Supplement, 21 October 2016. Claire Fox, What councils can learn from Trump, MJ (municipal journal), 16 November 2016. Claire Fox, Up in smoke, MJ (municipal journal), 13 December 2016. Claire Fox, We cannot let liberalism silence free speech, Times Educational Supplement, 16 December 2016. Claire Fox, Channelling anxiety for good, MJ (municipal journal), 1 February 2017. Claire Fox, What’s the right message?, MJ (municipal journal), 22 March 2017. Claire Fox, Watering down workforce diversity, MJ (municipal journal), 11 April 2017. Claire Fox, Respecting the will of the people, MJ (municipal journal), 17 May 2017. Informinc appointed 29 January 1997, company dissolved 21 April 2004 | Living Marxism | Academy of Ideas, Secretary and director appointed 16 March 2000 | Institute of Ideas - founder | Fiona Fox, sister. Caroline Scott, Claire and Fiona Fox, sisters, “Sunday Times”, 28 May 2006. Huw Spanner, Hope for the Best (Interview with Claire Fox),' Spanner Media April 2007. ↑ "Claire and Fiona Fox, sisters", “Sunday Times”, 28 May 2006. ↑ 4.0 4.1 RCP, The next step 2 May 1986, No. 17, p. 4. This page was last modified on 5 June 2017, at 15:24.